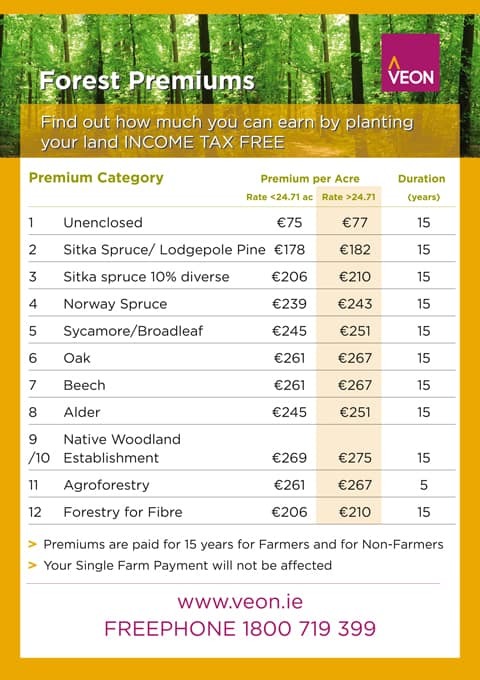 Forest planting rates and payment premiums - Veon Ltd.
General. The rates of Grant and Premium payable are determined by the category of the planted lands, the tree species and area planted. Land Categories and GPCs are defined below. Land Types and Categories. Eligible land types for afforestation under the Scheme are described in the Forestry Standards and Procedures Manual. Species Composition in Grant and Premium Categories. To be eligible for grant aid each plot within a forest must conform to one of the following Grant and Premium Categories (GPC’s). GPC 2 – Sitka spruce / Lodgepole Pine. This plot is comprised of Sitka spruce and/or lodgepole pine only. For landscape purposes, a small number of other species should be incorporated into this plot. A GPC 2 plot on its own is not eligible for grant or premium payments because it does not comply with plantation rules 1 and 2 as defined in Annex 2, and must be a component of a larger afforestation project comprised of other GPC categories. GPC 3 – 10% diverse mix. This plot is comprised of an intimate mix of Sitka spruce and/or Lodgepole Pine together with a suitable diverse conifer (as described in the Forestry Standards and Procedures Manual). The diverse conifer content must be at least 10% of the total number of trees planted. This diverse species can be intimately mixed through the forest or planted in groups through the forest, or a combination of both where silviculturally compatible with the main species. In an intimate mix, the diverse conifer species may be substituted by suitable broadleaves, including birch, planted in groups where soils are suitable. Broadleaves adjacent to roads and watercourses may also form part of this 10%. A forest comprising of just GPC 3 will satisfy the 10% broadleaved requirement where 10% additional broadleaves are planted for environment and landscape reasons. GPC 4 – Diverse. This plot is comprised of an acceptable conifer species listed in Table 10 of the Forestry Standards and Procedures Manual, other than Sitka Spruce and Lodgepole Pine. GPC 5 – Broadleaf (other than Oak/Beech). This plot is comprised of an acceptable broadleaf species listed in the Forestry Standards and Procedures Manual, other than Oak and Beech. GPC 6 – Oak. This plot is comprised of pure oak. On large sites where additional shelter is required, an appropriate nurse species may be introduced. Other patterns will be considered on case by case basis. GPC 7 – Beech. This plot is comprised of pure beech. On large sites where additional shelter is required, an appropriate nurse species may be introduced but there must be at least 10 lines of beech between each nurse species. Other patterns will be considered on case by case basis. GPC8 – Alder. This plot is comprised of pure alder. For species diversity, up to 10% of trees planted may comprise of other species intimately mixed or planted in groups. GPC 9 – Native Woodland Establishment (Scenario 1-3). This GPC applies to any plot proposed for native woodland establishment and where the application of the Native Woodland Establishment Framework indicates that Scenario 1 (Podzols), Scenario 2 (Brown podzolics) or Scenario 3 (Brown earths) applies. (The Framework is laid out in the Native Woodland Establishment Scheme Manual.) As set out in the Framework, each scenario has a corresponding ‘target’ native woodland type and the species mixture and planting design required to initiate it. The use of the Native Woodland Establishment Framework to identify the most appropriate native woodland type and associated species mixture and planting design for the site is a requirement under GPC9 and GPC10, alongside other rules that previously applied under the former Native Woodland Establishment Scheme regarding site development, planting stock, future management, etc. The required planting density and spacing for GPC9 is 3,300 trees / ha and 2.0 m x 1.5 m. Where variation exists across the site, each of the scenarios above must be included as a separate GPC 9 plot. GPC 10 – Native Woodland Establishment (Scenario 4). This GPC applies to any plot proposed for native woodland establishment and where the application of the Native Woodland Establishment Framework indicates that Scenario 4 (Gleys) applies. (The Framework is laid out in the Native Woodland Establishment Scheme Manual.) As set out in the Framework, this scenario has a corresponding ‘target’ native woodland type and the species mixture and planting design required to initiate it. The use of the Native Woodland Establishment Framework to identify the most appropriate native woodland type and associated species mixture and planting design is a requirement under GPC9 and GPC10, alongside other rules that previously applied under the former Native Woodland Establishment Scheme regarding site development, planting stock, future management, etc. The required planting density and spacing for GPC10 is 3,300 trees / ha and 2.0 m x 1.5 m.
GPC 11 – Agro-forestry. This measure will be targeted at silvopastoral agro-forestry systems which combine forestry and pasture. A stocking rate of 400 – 1000 trees per hectare (equal spacing) is acceptable and the minimum eligible plot size will be 0.50ha and tree-to-tree width of 20 metres. Acceptable broadleaf species will include oak, sycamore and cherry. Other species, including conifers will be considered on a site-by-site basis. The following agricultural activities will be permitted, so long as such activity is compatible with protecting the trees; Pasture: Grazing by sheep or young domestic stock is permitted during the spring and summer months for the first 6-8 years, depending on tree growth, but trees must be protected and tree shelters checked regularly. Thereafter, when tree shelters are replaced with plastic mesh, larger animals may be introduced. Fodder: Silage and hay production is permitted. It is important that appropriate machinery is used when cutting silage and/or hay so as to ensure that the trees are not inadvertently damaged. Agro-forestry must remain under forestry and therefore is subject to a re-planting obligation. Under state aid rules only 80% of eligible costs can be funded. Land classified by the Department as ‘unimproved/unenclosed’ will not be eligible for support under the Agro-forestry GPC. Grant rates and payment structure will be similar to the afforestation scheme and paid on fixed grant basis. Premiums will be paid for five years and will cover the cost of maintenance only. Support for the establishment of demonstration plots for research purposes may also be considered under this scheme. GPC 12a – Forestry for Fibre. Italian Alder, Hybrid Aspen, Eucalyptus, Poplar. Stocking shall be a minimum of 2000 plants/ha at establishment. Preference will be given to applicants who propose to use improved genetic material, such as planting stock from the national and other documented tree improvement programmes. Once land is converted to forestry for fibre it will be classified as forest land and the provisions of forest legislation will apply. Support for short rotation coppicing, Christmas trees or fast growing trees is not provided for under this measure. Fast growing trees are defined by Ireland as having 9 years between cuts. Trees planted under this scheme will be cut between 10 – 15 years. Freephone 1800 719 399 for more information.